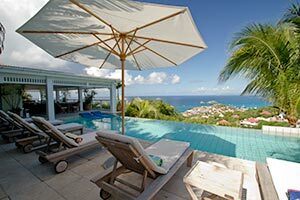 Villa UJV 376, also referred to as Mes Amis, is a four-bedroom villa located in Lurin, St Barts. As you enter the villa, an amazing, lush, tropical garden surrounds you. The wonderful pool area offers incomparable views over Gustavia and the neighboring islands as well as year round sunsets. Enjoy the magnificent view and privacy of this villa, while relaxing on the comfortable sofas on the terrace, or dining alfresco under the star-filled sky, with the twinkling boat lights of the harbor in the distance. A second dining area is located in the gazebo on the patio. The villa is been furnished to the highest standard and excels in classic elegance, using the finest materials. Dark wood furniture, tumbled marble floors, French blue sofas with yellow accents and tropical plants give the living room a traditional West Indian ambiance. Two of the bedrooms are located in the main villa and open on to the terrace and the view. The two other bedrooms are in a separate pavilion that are be accessed from the exterior or via the tropical gardens from the main villa. An exquisite villa offering every possible comfort!